I think “Kingkong” is a charming name for an American filmmaker to use in Asia. King Kong is the premier giant monster of the United States — he clung to the Empire State Building, after all, whereas the other well-known monsters destroyed Tokyo. 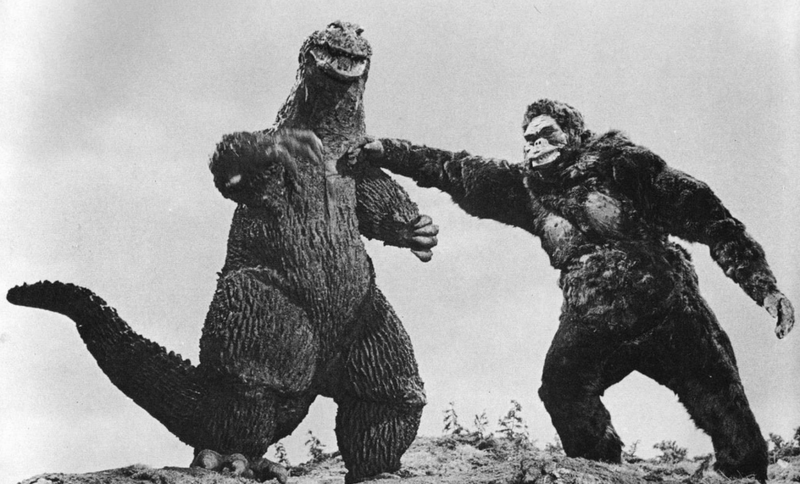 And only the English-language publicity materials for King Kong vs. Godzilla stated unambiguously that King Kong was victorious in their battle (which seems strange — I would’ve bet on the fire-breathing lizard). Even if my friend didn’t tower over everyone in Bangkok, “Kingkong” would’ve been a great work name. But the fact that he’s a giant (even in the U.S., where people are on average much taller), and has a strong wiry physique, and can scale the exteriors of children’s jungle gyms with frame-quaking leaps and bounds, makes the name even better. Seriously, it’s a joy to watch him on the playground. Seeing his kid is all right, too, since the kid is liable at any moment to scale something disconcertingly high (I didn’t even realize that 16-month-olds could climb ladders or monkey bars), turn, do a celebratory dance, then announce, “I did it.” At the same time, though… every kid plays. Just like every kid draws. It’s nice to see, but it’s expected. Whereas it’s sadly rare for an adult to retain so much of that playful spirit. Here’s N’s best friend at seven months old, already conquering our local playground — filmed by KK. Which is a shame. Adults need to play. If I had to pick one single aspect of Homo sapiens evolution as being most important for our success, it’d be our extended juvenescence. Many species are good at learning while they’re young — but humans, mentally, are inclined to be forever young. Inclination, though, is not a guarantee. We do age, and we can ossify into routine. We can suppress our urge to play until it goes away. And that’s sad. Among other benefits, those who continue to play throughout their lives seem to preserve their mental acuity longer. Sure, adults can slap down some money and join a climbing gym. Or, if you live near St. Louis, you could visit the fabulous City Museum. And the lucky among us can find employment where we actually get paid to solve puzzles or learn — to my mind, that counts as play. But that leaves a lot of people out. I wish there was more public infrastructure to support adult playfulness. In Bloomington, we’re blessed to have such a wonderful public library, but a venue for physical play would be nice, too. We have a lot of playgrounds, but they aren’t really intended for adults. See? I get to be on playgrounds again now, but only because N is serving as my beard. Uncle Marshall and Auntie Ferret, too, have seemed happiest recently when they’ve been at various playgrounds in town. They joined me, which meant three adults getting to play, all justified by one seventeen-month-old romping in our midst. I’m glad that my daughter serves as cover for us to have fun. I’m just a bit sad that’s what it takes. On non-violence (part 2): empowering kids to act for equality. On Eka Kurniawan’s ‘Beauty Is a Wound,’ mythology, and misogyny.